Katie suffers post-partum OCD in silence for fear of destroying her life, but loses that life when her husband Callum realizes that he’s ignored her problem too long and feels their marriage is irreparable and their daughter is in danger. She disappears and he raises Maisie alone, with support from his best friend Jake, cutting out Katie’s sister Delaney also. In a jarring coincidence, Katie’s artistry brings her in contact with her daughter, who believes her mother died, and she sees evidence of inherited OCD. She must convince Callum, a man whose past blinds him to his family’s needs. 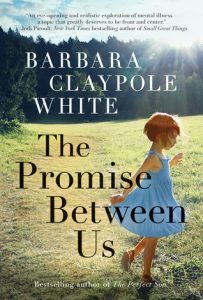 With Callum’s pregnant second wife included in the family picture, alliances shift, romances are roused, and a little girl teaches adults how to behave. Though the repetition can be nettlesome to the reader, Katie’s constant fears and reminders demonstrate the experience of OCD. There may have been a bit much to the back and forth of convincing Callum, since Katie’s argument never really shifts. Persistence seems to be the key to OCD. It’s clear the author did her research and she acknowledges her resources. This is a good story to read for a sympathetic, but not pitying, representation of living with a mental illness.